Detail and protect your Dodge Neon, SRT-4, Charger, Intrepid or Chrysler 300M's door handles with these unique Simulated Carbon Fiber Door Handle Decals. Manufactured with our DuraCOLOR Graphics Technology, this three dimensional looking decal set will enhance the overall look of your ride. They'll also protect your Door Handles from fingernail scratches. The simulated carbon fiber features a light Silver Metallic outline that enhances the look. 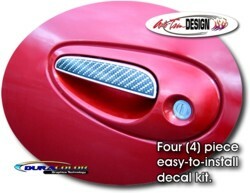 This four (4) piece kit is very easy to install and looks Great! Each decal measures 5.179"x .982" (13.15cm x 2.49cm). If your door handles look like the one shown, these decals will fit. Please measure your door handle prior to placing an order for this item.